The Sale School (Old Brick, on right) was built in 1856 and is the first public school in Green Bay. Class photo (on left) of children at the Fifth Ward School. Founded in 1856, the Green Bay Area Public School District is more than 150 years old. 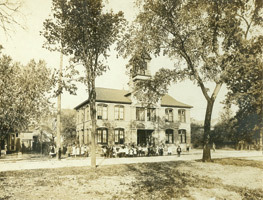 The first public school, the Sale School, was built on the east side of the Fox River. On the other side of the river, the establishment of the Fort Howard military fort brought tuition-based education in 1791. Both sides of the river functioned separately until 1895. The first high school commencement graduated six students in 1875 on the east side of the river, and in 1878, Nellie Richardson was the first high school graduate of the Dousman school (Second Ward School) in Fort Howard. Pride and tradition run strong in the city of Green Bay. Both Green Bay East and Green Bay West High Schools have fourth generation students walking the hallways. In 1905, the schools competed against each other in the first interscholastic football game, a rivalry that still runs strong today. Regarding football, East High School is also home to City Stadium, where the Green Bay Packers (founded by East alum Earl Louis "Curly" Lambeau) played from 1925-September 1957. The site is a must-see stop for Packers fans, as is Curly Lambeau's house, located across the street from Nicolet Elementary School. For more than 150 years, the district has been providing a quality education to the children of the community. The school names provide a glimpse at the founders and influencers of our city, state, and nation, as well as notable alumni. Our oldest standing school is Howe Elementary School, built in 1912; our newest is Red Smith School, built in 1999. Also, visit the district timeline for a full (but not complete) history of the district. The Green Bay Area Public School District provides a rich history of tradition, combined with a forward-thinking attitude.